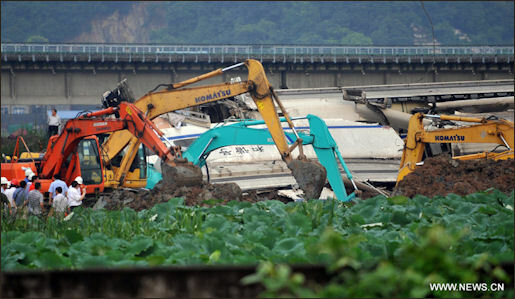 after the Wenzhou train crash “The accident caused much public anger and came to be seen as emblematic of the problems with China's breakneck development over the past three decades, sometimes achieved at the expense of public safety,” AP reported. “Public ire has been focused on the Railways Ministry, which has long functioned as a government within a government, operating its own police force and courts and incubating a culture of privilege and corruption. Media and online commentators have questioned the official explanation of the accident and called for an independent investigation excluding ministry experts. Victims' families have complained that ministry officials have only discussed compensation while avoiding the issue of responsibility. Newspapers questioned the official account and conspiracy theories dominated Chinese social media sites. Efforts by the propaganda department to bar Chinese media from questioning official accounts of the accident fuelled the anger and suspicion, especially about the death toll and rescue efforts. Many members of the public suspected officials had covered up facts and restricted media coverage of the accident to protect an ambitious rail expansion plan and the Communist Party's image of unruffled control. More than 100 relatives of victims protested at the Wenzhou South station, demanding to know the truth about what happened, according to the Global Times, an English-language newspaper affiliated with People’s Daily, the Communist Party’s official paper. At the protest at the train station, relatives held up a banner nearly 50 feet long that read: “Disclose the true reason behind the July 23 train crash and respect the dignity of victims,” the Global Times reported. The Global Times, a tabloid owned by Communist Party mouthpiece the People's Daily, said the protesters demanded direct talks with officials from the Railways Ministry. "They claimed that the bullet trains were built with advanced technology. How could lightning paralyze them so easily?" 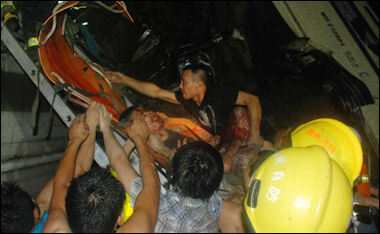 the newspaper quoted Wang Hui, whose husband died in the accident, as saying. The newspaper showed photographs on its website of dozens of people with some holding a banner that said: "Disclose the true reason behind the July 23 train crash and respect the dignity of victims." At about 8:40 p.m., Wang remembers, Tangtang started screaming and crying. They had to leave the wedding early. What she didn’t know was that 10 minutes earlier, another train, traveling more than 100 kilometers per hour, slammed into Zheng’s train. The impact knocked three rail cars off a viaduct and another hanging over the side. On her way home from the wedding, Wang got a call from the family of a friend who was traveling with Zheng informing her of the collision. The friend had tried to find Zheng in the chaos but couldn?t. Wang says she tried Zheng’s phone. No answer. He probably lost his phone in the accident, she remembers thinking. Early on July 25, Wang was driven by relatives to Wenzhou. When they reached the highway exit, she received a call telling her to go to the morgue not a hospital, as she had believed. "It felt like the sky collapsed on me," Wang says. When she collected his body, there was one thing missing: Zheng’s silver Audemars Piguet wristwatch. He’d planned to give it to Tangtang when she got older. Only a mark remained on the wrist where it was, Wang says. The police told her it must have been lost in the crash, she says. She thinks it was stolen. "When my daughter grows up, what can I say to her?" Wang says. "Her dad is gone. Just like that. Leaving her nothing but a watch, which nobody knows who took." Since the accident, Tangtang has become clingy and likes to open her parents’ wedding album, Wang says. When she sees her daddy’s picture, she kisses it. Wang kept her husband’s last train ticket. "It feels as if he’s still on a business trip," she says. 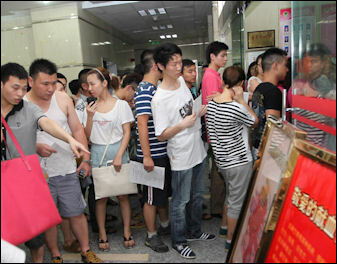 On Aug. 22, a day before the one-month anniversary of Zheng’s death, the widow commemorated his 35th birthday. She bought him some new clothes. A weeping Liu Canlan said her husband Chen Wei had last spoken to her on the telephone while he was on the train, promising to be home in time for dinner. "I kept calling out to him but there was no response. 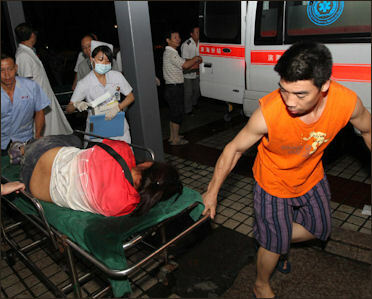 He just left us, a wife and son, like this," said Liu. "How could this happen? How can this high-speed train be so lousy? It's just like a tiger that eats people up," she added, her voice chocked with emotion. In another part of the morgue a mother who lost her teenage son fainted after cremation rites had been finished, and had to be carried out by relatives. While many relatives said they were happy with the concern the government was giving the crash, they put the blame on local officials and the Railways Ministry for what they saw as dismal crisis management. Zhang Meilan, who lost her niece, said they had not been told how much compensation the family would be getting but had been told to sign an agreement. "Everything that the government officials told us has been very good and of course we thank them very much. But the main thing for us is the response from the railways department and how they will help the families of the victims deal with this problem," Zhang said. "Today, the district office told us that if we do not sign (the compensation agreement), they are going to leave. They said if we want to wait, we can wait here but they would not care about us. What kind of rationale is this?" Bloomberg reported: For all her discontent, Wang Hui accepted the compensation offer after she was repeatedly visited by unidentified officials. On Aug. 2, one group came to her hotel in Wenzhou to offer condolences and muttered audibly about potential problems with her husband’s body because it wasn’t refrigerated, she says. "I felt that I had done things that hurt my husband," she says, tears rolling down her cheeks. "As if I were the one discussing compensation using his body." There was no choice but to sign, she says. Huang Leping, a Beijing attorney Wang had consulted, said she had little chance of winning if she sued the ministry.Victims in such cases are often helpless because China’s courts may not hear the cases and lawyers are warned away from representing them, says Jerome Cohen, a professor of law at New York University who specializes in China legal issues. Those who continue to protest for greater justice also risk recriminations. Zhao Lianhai, whose son was poisoned by milk contaminated with melamine, was jailed after he tried to organize other parents to campaign. He’s since been freed. Wang says she just wanted to ensure her husband was cremated so she could take his ashes back home. Wan used the Internet to voice her disgust. "I will never accept the railway ministry’s apology," she wrote Aug. 12 to her followers on weibo, the Chinese name for microblogs. "When we have the truth, my husband’s soul can rest and the whole family can have a little comfort," Wang says from her home in Lianjiang in Fuzhou, 368 miles (592 kilometers) south of Shanghai. "Give us some guarantee that the lives of ordinary Chinese are safe." Chinese flooded Internet bulletin boards, video-sharing sites and microblogging sites with their outrage over the handling of the train crash and furious complaints about breakneck development without heed to safety. Many also expressed fears of a cover-up, especially after reports that one train car was buried at the site despite the ongoing investigation and only later excavated. 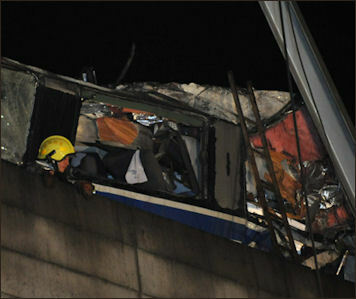 Some members of the public questioned the official death toll. The government censors assigned to monitor public opinion have let most, though hardly all of the weibo posts stream onto the Web unimpeded. But many experts say they are riding a tiger. For the very nature of weibo posts, which spread faster than censors can react, makes weibos beyond easy control. And their mushrooming popularity makes controlling them a delicate matter. Chinese government issued instructions to domestic media, prohibiting reproduction of weibo messages or covering the story on their own. Media were ordered only to use articles released by the state-run Xinhua News Agency. Some media did not comply with these instructions. Weibo users were able to sidestep the government media completely. This phenomenon has never been seen on this scale before. There is no clearer sign of the rising influence of microblogs than their impact on government itself. Wenzhou bureaucrats, for example, ordered local lawyers not to accept cases from families of victims without their permission. After weibos exposed them, they withdrew the order and apologized. “I call it the microblogging revolution,” Zhan Jiang, a professor of international journalism and communications at Beijing Foreign Studies University, told the New York Times. “In the last year, microbloggers, especially Sina and Tencent, have played more and more a major role in coverage, especially breaking news.” The few newspapers and magazines here that consistently push back at censors with investigative journalism are not just printing the results of their digging into the train wreck, but posting them on weibos for millions to see. So were hundreds of more traditional state-controlled news outlets. China Daily: Why the Rush? In this madness for speed, we tend to forget that faster and higher do not necessarily equal better. Of course, living standards have risen for most of us, but if we stop to contemplate the costs, we will be shocked. Besides the environmental costs, there is the unaccounted-for price of mental health that is often left out of the equation. When we feel dizzy by the world that is whizzing by, when we get nostalgic about the simple life we used to lead in dilapidated homes (which was actually not that good, if one is objective), it could be signs that growth is a bit too fast for comfort. We Chinese always want to get ahead of the neighbor. If our neighbor's kid has a score of 98, we want ours to get 99 or 100. Does the higher score reflect his or her higher ability? We don't really care that much. On a national level, we want to accumulate the biggest tally of gold medals at the Olympics. Does that speak of the bigger picture of the country's fitness and sports? It's just an afterthought. We even want to have all those trivial and strange conquests that belong to the realm of Guinness World Records - not for fun, mind you, but for bragging rights. We are pursuing speed for the sake of speed, or for the sake of vanity. Other countries also try to "keep up with the Joneses", but nowhere is this as pronounced and concerted as here in China where it is an obsession - from the highest official to the lowest footman. In this relentless drive for growth and wealth, collisions are bound to occur. Of these, the one between development and a citizen's right to their homestead is probably the most acute, and the one between development and the ecology, the most sustained. The old order is crumbling, and the new is not yet ready. There is a vacuum that scamsters and demagogues are only too happy to fill. Rules and regulations are often tossed aside as an inconvenience. Look at this report from last year from the Railway Ministry's own newspaper: Some German specialists were hired to train the drivers of bullet trains. They said they needed three months to complete a training course. But they were told they had only 10 days to do the job. It became the ego trip of the rail department that they could turn out drivers in 10 days while in Germany they needed as long as three months, to the extent this report was spread far and wide as a token of its achievement. Who benefits from such haste? Surely, not the passengers. Realistically, it enhances only the self-glorification of a few people and departments.High speeds will take us to our destinations in a shorter time. But not every trip is intended to save time. We take a ramble in a park at a leisurely pace...We don't really need the frenzy of non-stop acceleration, especially when higher speed comes at higher risks to safety. Accidents are sadly unavoidable. But that is no excuse for those errors that occur as a consequence of lax management or under-tested facilities. It is time we paused to reflect on the purpose of the journey that is life.When we slow down, we'll notice that life is not always a car race. Our skyline may take on new shapes, but our conscience should remain in shape. Our trains may derail, but many of us tenaciously hold on to our old morality, our sense of good versus evil. Wait a while for your morals. Wait for a while for your conscience. Don’t allow our country become an endangered building. Allow each life enjoy freedom and dignity. The notice published on the front page of the People's Daily did not mention the July 23 train crash. But it said that information on major emergencies and topics of widespread interest should be made public "objectively" and in a timely way. This includes the results of investigations, official measures to deal with the emergencies and preventive efforts, the notice said. 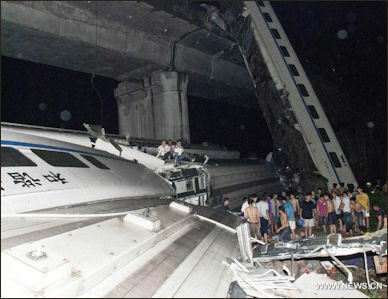 the Wenzhou train crash When Premier Wen Jiabao visited the accident site a few days after the crash he promised the government would issue a report to "get to the bottom" of what happened. After the uproar over the buried carriages the railway ministry was taken off the case. The State Administration of Work Safety, which reports to the State Council, or Cabinet, was put in charge of a full probe, according to Xinhua. The government also fired three officials, including the head of the regional rail bureau, and started a two-month review of railway safety. The accidents prompted month-long inspections of dozens of projects and 3,700 miles (6,000km) of bullet train lines. Sheng Guangzu, who became rail minister in February 2011, pledged to ensure the “absolute” safety of high- speed railways by improving the quality of equipment, management and training, according to a statement posted on the ministry’s website yesterday. Although the railways are rushing to fix the faulty systems, some experts believe train services should be stopped until all the problems are fixed, the Daily News reported. It cited an unnamed expert saying that the crash occurred because of an unusually heavy lightning storm and that the signals should normally work. Whether they would be replaced would depend on a variety of factors, including cost, it said. "There were also many problems with management and co-ordination and some of the workers are not well qualified," the Daily News cited the report as saying. However, assigning responsibility for the mismanagement is proving controversial, it added. Huang Yi, a spokesman for the State Administration of Work Safety, told the state-run Xinhua News Agency in late August the Wenzhou crash "could have been avoided and prevented." Huang Liu Lianguang, a professor at North China Electric Power University who was a member of the investigative panel, said Sept. 16 it had found signal software problems and human error contributed to the crash. Some members of the public still question the official death toll. Hua Xinmin, whose grandfather was a prominent Chinese railway engineer, is collecting the names of riders in six of the most damaged rail cars to determine if the government’s accounting is accurate. Her weibo posts were forwarded 10,000 times before being stopped by the service provider. "This is about the dignity of each life and a safe tomorrow," Hua, a French citizen living in Beijing, says. "What’s at stake is the credibility of the government." The event seemed to resonate especially strong with China’s growing middle class, computer-savvy, able to afford travel by high-speed rail, already deeply skeptical of official propaganda. Andrew Wedeman of the University of Nebraska-Lincoln told Bloomberg the outrage over the crash has a very middle class tone to it, . "They’re angry about the quality of the train and the cover-up," he said. "China’s professionals, the beneficiaries of reform, who should be rock solid in their support for the regime, are beginning to question the ability of the government to furnish a better life." A week earlier state media said investigations into the crash had determined it was "completely avoidable", adding that design defects had likely caused equipment failures and emergency plans were also deficient. An official quoted in the Economic Weekly said: "In reference to the possibility of human error,"it's no secret within the organization that railway signals don't respond properly during emergencies. The official on duty should have used wireless communication to inform the conductors of the situation." The government said that design flaws and mismanagement caused the July 23rd crash The Cabinet statement cited "serious design flaws and major safety risks" and what it said were a string of errors in equipment procurement and management. It also criticized the Railways Ministry's rescue efforts. The report affirmed earlier government statements that a lightning strike caused one bullet train to stall and then a sensor failure and missteps by train controllers allowed a second train to keep moving on the same track and slam into it. Those singled out for blame included former Minister of Railways Liu Zhijun, a bullet train booster who was detained in February amid a graft investigation. Also criticized was the general manager of the company that manufactured the signal, who died of a heart attack while talking to investigators in August. The decision to assign blame to one figure who already has been jailed and another who is dead, along with mid-level managers who have been fired, suggests further political fallout will be limited. Several officials including a former Communist Party secretary of the Shanghai Railway Bureau were ordered dismissed from their party posts, a penalty that is likely to end their career advancement. Others received official reprimands but there was no mention of possible criminal charges. Thousands of postings on microblogs and Internet bulletin boards criticized the penalties as too mild. 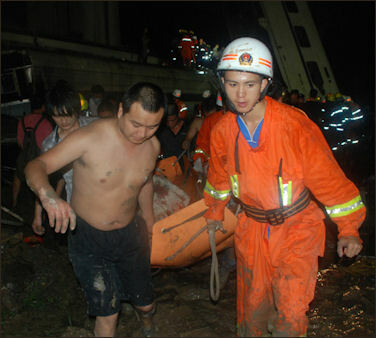 They said too few senior figures were held accountable for the disaster near the city of Wenzhou. Before the crash, the bullet train network enjoyed support from Communist Party leaders and a political status on par with China's manned space program. Since then, Chinese leaders have distanced themselves from it, scaling back expansion plans for the multibillion-dollar bullet train and overall construction spending on China's rail network, the world's largest. Ahead of the crash report, even normally docile state media expressed skepticism about the outcome of the investigation. Among those blamed were a former railway minister, Liu Zhijun. "Liu Zhijun has been in jail. To claim someone in jail is guilty will spare other people. Is that too hard to understand?" said a note on Sina Weibo signed Yizhidouhuai, or "Always Bad." Also blamed was the general manager of the company that made the sensor. He died of a heart attack in August while talking to investigators. The report promised improved safety and oversight of technology development but gave no details on planned changes. Some online comments suggested sarcastically that authorities who need to deflect blame should have cited 19th century steam engine pioneer James Watt or imperial-era officials who promoted railway development. "The black hand behind the curtain was anti-China forces based overseas, and the leader of them is called Watt," said a note on Sina Weibo. "Why did you invent the steam engine?!" Around the time the report was released a man was struck by a bullet train and killed near the southeastern city of Xiamen after he climbed over a safety barrier and tried to cross the tracks, the official Xinhua News Agency reported. It said the train halted for 18 minutes and then continued on to Xiamen with a "bloody dent on the front of the locomotive." After the accident, Bloomberg reported, the rail ministry has suspended approvals on new projects nationwide, recalled 54 high-speed trains and removed three top regional railway officials from their posts. "The accident is a blow to government’s ambition to attain world class technology for the country," says Nicholas Yeo, the Hong Kong-based head of China and Hong Kong equities at Aberdeen Asset Management, who oversees $70 billion. "It points to the country focusing on speed at the compromise of quality." The crash bruised the reputation of the rail industry at the heart of China’s plans to spread prosperity inland and provide exports more sophisticated than consumer goods. The high-speed network -- dubbed Harmony after the regime’s goal to create a prosperous, "harmonious society" -- opened in 2007 and was slated to be the world’s biggest network at 16,000 kilometers (9,900 miles) by 2015. The government said it would suspend new railway project approvals and launch safety checks on existing equipment to address public anger following a crash on a new high-speed rail line in July which killed 40 people. The Railway Ministry is facing a high debt burden too. It said in August that its total liabilities at the end of June were 2.1 trillion yuan ($329 billion), up by nearly half from the end of 2009 and bringing its liability-to-asset ratio up to 59 percent. "Almost all banks have stopped lending for railway construction," the newspaper cited an unnamed source close to the Railway Ministry as saying. "There is no decision yet on the next move for China's high-speed railways." 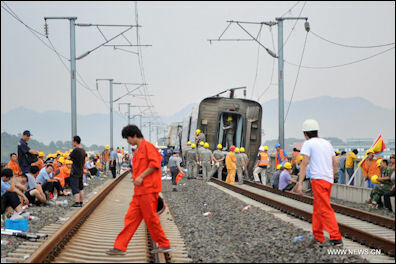 After the crash the Chinese government said ordered the maximum speed of trains on the newly-built lines to be lowered by as much as 20 percent. 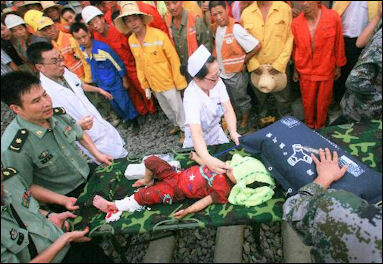 In late August, China.org reported, began rescheduling trains to run at slower speeds over safety concerns. The rescheduled plan involves 498 trains and major rail lines such as Beijing-Harbin, Beijing-Guangzhou, Beijing-Shanghai and Lianyungang-Lanzhou lines, according to the Ministry of Railways (MOR). Earlier in August high-speed trains traveling between Beijing and Tianjin and between Shanghai and Hangzhou had their speeds reduced to 300 km per hour, down from 350 km per hour. After the late August readjustments, lines that had been trains running at 250 km per hour, reduced speeds to 200 km per hour. These lines included the ones between Hefei and Nanjing, Hefei and Wuhan, Shijiazhuang and Taiyuan and other lines. CRH trains that ran at 200 km per hour were slowed to 160 km per hour, it added. China's government has said it will reduce its train fares by five percent, in a move believed to be aimed at attracting commuters back to the country's beleaguered rail system. “China’s rulers love to point out the shortcomings of Western-style democracies; the “Beijing model” by contrast gets difficult jobs done. That view is often echoed by Western businesspeople. Yet breakneck economic development has cut corners, distorted priorities and created big conflicts of interest. The railways ministry is manufacturer, operator and regulator of the network. Now ordinary Chinese folk are questioning their country’s less-than-triple-A politics. A hurtling train is a metaphor for runaway development that is generating its share of collapsing buildings, lethal coal mines and bulldozed neighbourhoods. By contrast, Japan’s bullet train has had just one fatality in 47 years, a passenger caught in a door. "After the accident the financial industry will have even less confidence in high-speed trains," Zhao Jian, a professor of economics at Beijing Jiaotong University, told Bloomber. "Its funding crisis is approaching." The central government may have to bail out the rail system because its failure would lead to the collapse of the economy, Zhao said. "The markets were concerned about possible slowdown of high-speed railway construction when the railway minister was sacked," said Du Jun, an analyst with Shanghai Securities. "The accident might have some impact on export of the high-speed rail as overseas clients would obviously have doubts on quality and safety issues.” Shares of China South Locomotive fell as much as 16 percent to its 12 month low of HK$5.85. Shares of China Northern Locomotive, which dominates China's train equipment market with CSR, fell 9.6 percent in Shanghai. Shares of Zhuzhou CSR Times Electric, a train-borne electrical systems and electrical components maker, were down 14 percent. China Automation Group, a safety and critical control systems provider, fell 19 percent while China Railway Group, an infrastructure construction firm, lost 6.7 percent. 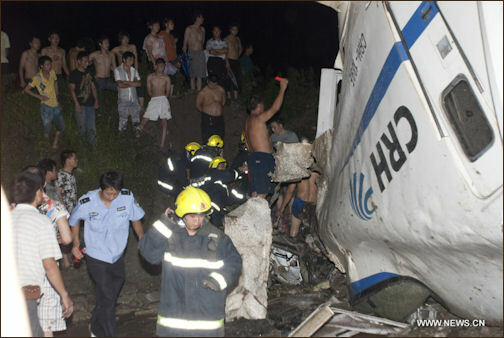 Shares of Chinese airlines gained sharply as investors hope more travellers would take to the sky after the train crash. Air China rose more than 3.5 percent while China Southern Airlines and China Eastern Airlines gained 3.4 percent and 4.7 percent, respectively. Bloomber also reported that China’s plans to export its rail technology may also be damaged, says Kao Tsung-chung, a visiting professor of railroad engineering at the University of Illinois in Champaign-Urbana who’s involved with planning for high-speed rail projects in California and Illinois. "Now there will be more scrutiny," Kao says. "The reputation and future of China’s high-speed rail is at stake with this report. The government isn’t known for transparency so they’ll have more difficulty convincing people the problems are addressed." “The ministry enjoys too high a ranking and too much power,” Mao said. Separating the ministry’s regulatory and operating roles would bring the railways into line with other parts of China’s state-run economy, including aviation, telecommunications and energy. In those sectors, government-backed companies, which are often listed, run the day-to-day businesses while separate state agencies regulate them. But the size of the debt may hinder efforts to break up the rail ministry, Stephen Green, a Hong Kong-based Standard Chartered analyst, said.